Since Mama and The Kid (AKA Domer) are off to the movies — again! — I’m manning the computer. It’s one of those “unstuffies” that has squeakers but no innards, and Mama thought that would keep me from ripping it to shreds. Hah! What does she know? And when Mama caught me trying to finish the job of blinding Goose, why, she grabbed the scissors and promptly snipped out his remaining eye. She said she didn’t want me choking on it. Personally, I think that was rather mean of her! Really, I love my goose. And I miss him. He makes a nice addition to my barnyard and now I can enjoy that “Duck. Duck. Goose” game. But by far, the bestest present was from Mama’s blogging buddy Katybeth, who sent me a fuzzy, stuffed Goose that really HONKS! Let me have him, Mama! I’ll go easy on him, honest! ‘Tis a true friend who spots a need and does something about it — thank you, Miss Kb!! I won’t tell Santa Paws that you’ve been impersonating him! This entry was posted in Dogs and tagged Christmas toys, goose, Star Wars movie. Bookmark the permalink. Those eyes are universal in the desire to be pulled. Your mommy is taking care of you. Maybe she will make a ball out of goose that will be like having goose available for chewing. If only Mama were the creative, sewing type, Mr. John…sigh. She’s not, but maybe she can improvise, now that you’ve made such an excellent suggestion! We roll the tears inside the toy. They have fun taking it apart but it takes a while. (We take all the stuffing out. We call them the flat toys. Thanks — I’ll pass this along to Mama. Flat toys mean she doesn’t have to drag out the vacuum as often! 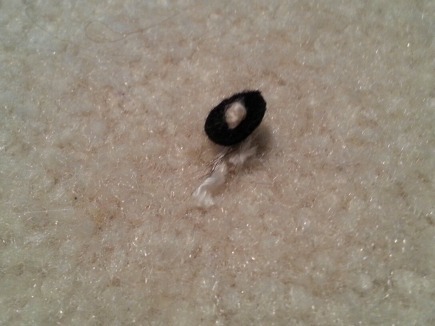 Sadly, she no longer leaves unattended elastic lying around the house. Ah well! Mama’s seen those cat toys with wands, Tommy and Tuppence. I, of course, won’t play with them, but I love to chase a laser pointer dot-thingy! You do, too, right? I wasn’t aware cats and elastic didn’t get along, but I can see the problem. Your servant sounds like a wise woman! Wonder why toy-makers even bother to put eyes in our toys if they know we’re going to yank them out?!! Oh yes! Well, Tommy loves the laser toy. I think it’s rather beneath my dignity. Plus, I can never seem to catch the dadblamed thing! I think Santa Paws needs to have a talk with the Amazon Elves. 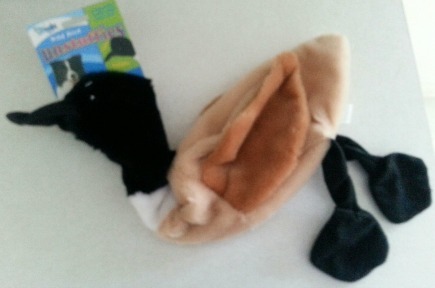 A goose should be able to withstand some rugged play…And Santa Paws rarely sends toys with squeakers something about caring for the sanity of pup parents. Mmmm. And it looks a little limp. Santa Paws believes a goose should be fat. It’s been a long Christmas–perhaps an Elf indulging in some nog made a mistake. It happens. On it. NOOO, Miss Katybeth, those Amazon Elves did a SUPER job! I actually got TWO geese for Christmas, see? The first one, the unstuffy, was one Mama picked up locally. May I say, cheaply made and designed to be shredded??! Yours, the second fuzzy one, is delightful. Why, just this evening, I had him in my mouth and was shaking him around, making Mama laugh. That goose has a honker in its body and it’s MUCH better designed. I’m still trying to pull its eyes out though — I don’t really like my toys looking at me, if you get my drift. Anyway, THANKS!! Bwhahahahahaha! Dallas, that CRACKED ME UP! 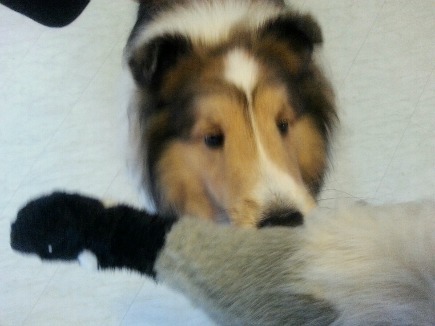 Hey, I love your new goose toy, buddy! And I know I’ve said this to you before, but you have the CUTEST little face I’ve ever seen on ANY dog. You’re absolutely ADORABLE! I’m glad to hear you had a great Christmas! Wishing you, Mama and Domer a Happy and FAAAAAAAAAABULOUS New Year! Aw, Mr. Ron, you’re sweet — thank YOU! Glad I made you happy with my naughtiness — too bad Mama and The Kid weren’t as impressed! Now Mama’s got both my new geese tucked away on top of the piano, where I can’t reach them. I’m just about to report her to Santa Paws — he won’t be happy knowing she’s withholding my toys, right?!? Have yourself a merry New Year’s, and don’t work too hard!! Dallas, it looks like you’ll keep her on her toes and she may develop skills that rival top surgeons :) Enjoy duck-duck-goose and have a happy new year! Thank you, Miss Janna! I doubt Dr. Oz has to worry about Mama transitioning over into surgery, but one never knows. Here’s to a very Happy New Year for you as well!! Ooh, you lucky dog! All my dogs got was a salmon biscuit which they devoured. Henry no longer plays with toys and Oliver still has quite a few from his early puppy days, which he still plays with. I feel kind of guilty I didn’t get him any new toys, but oh bother. So, what films did your mama and big bro see? Any good ones? Oh, dear, Miss Monica. I promise not to brag to Sir Henry and little Oliver about my new toys. Oh, dear, they really didn’t get any?? Now I’m all sad. Would you like me to ship them some of mine? 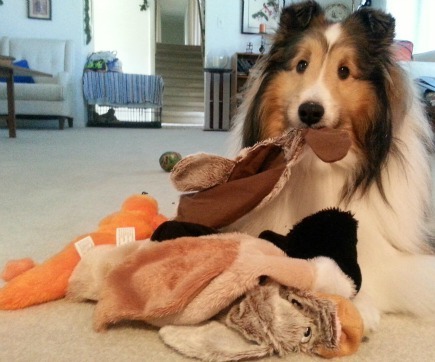 Mama’s always talking about sharing some of my toys with the “poor dogs” — whoever they are! — and while I don’t fully understand that, I do understand that dogs can’t play without toys!! Mama and The Kid saw that Star Wars film…twice!! Oh my Dallas!! You are quick to kill a new toy! 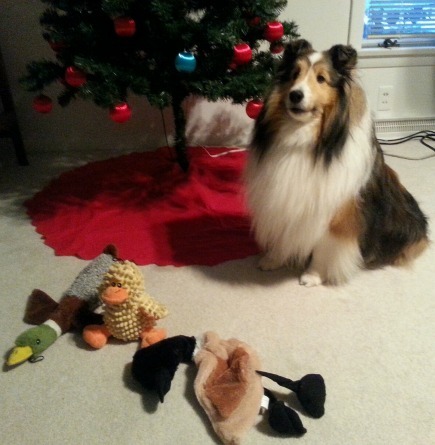 Katie hasn’t destuffed any of the toys she has ever received. She has them all, even the ones she had as a baby. I wonder why some dogs like to tear into toys and others don’t? Miss Dawn, Katie is a Princess. I am a warrior. There’s a difference, you understand. Actually, I still have the first toy I ever received and while it’s kind of nasty (or so Mama says! ), it’s intact and still makes a sound when you squeeze it. Perhaps over the years they’ve started to make dog toys cheaper??! Dallas, you and my Lucy Pie would get along just fine. She’s not happy until she removes eyes, squeakers, and any stuffing from her toys either! Delighted to reconnect, Miss Tee!! Thank you for leaving me a link so I can hop on over and catch up with you! I’m also happy to hear Dallas isn’t the only spoiled pup who rips his toys up — perhaps he and Lucy have already figured us out, that we’re softies and will readily supply them with new ones?! ?